Baltimore-based comedy troupe Wham City Comedy has always straddled the dirty railing that is dark comedy and horror. If you’re like me, then they clearly speak to you and your spooky-365-days-a-year kind of soul. Lucky for us, they’re back again with something for those dark and rainy Halloween nights. Wham City returns this week, with a departure from their very visual style of comedy in the form of a scary and thrilling audio book. Reverse Transmission is what I would imagine Stephen King’s Christine and Knight Rider of Hasselhoff fame would be in 2018, with a pitch black sense of humor. Available now, Reverse Transmission tells a very Black Mirror telling of a self-driving car and its reluctant would-be driver, opening with the beginning kill. With the car voiced by Wham City’s own Alan Resnick, Reverse Transmission keeps the pace quick with a new shock and WTF moment just as you think you can relax. Spoiler Alert: Just accept that you won’t be relaxing, get comfy on that pointy edge of your hardwood chair, and you’ll be fine. While the comparison to Knight Rider or Christine is not intentional, Wham City’s Ben O’Brien gets it. O’Brien, who directed the audio book and came up with the initial idea (along with his brother and writer Param Anand Singh), just figured that the timing for it might as well be now. Anyone who loves Wham City Comedy as much as I do will be quick to tell you that most of their unique blend of comedy relies heavily on visual elements and cues (such as last year’s Cry of Mann, and This House Has People in It). O’Brien shared that what makes this such a departure from their previous work, and what made it more of a challenge, was the simple fact that they could not rely on the visuals for this. Their sound cues and punches had to be just right in order for it to work. But will there be more audio books in the future for Wham City? While naturally the numbers and response will be the final telltale, O’Brien fervently hopes so. “I personally am definitely going to continue [with audio books] because I fell in love with the format,” said O’Brien. “I’m very interested. It all depends on how this one goes, I mean that’s always the nerve-wracking thing. Normally we get aired at 4a on a TV and they’re not looking to closely at our analytics so that may or may not be a good thing,” he laughed. As I spoke to O’Brien about Reverse Transmission, I would be remiss if I didn’t notice and point out just how stoked he sounded for this to be released. Ultimately despite the challenges, his favorite part about working on this was being in the director’s chair. So pull up your dusty Victorian-style high chair, set that fire pit aglow, and load up Reverse Transmission on your computer or your iPhone. This is no doubt going to be a go to Halloween classic for years to come. I was just thinking to myself, it really has been a long time since someone has brought a good, strange surrealist comedy show ala Kids in the Hall or The State into the world, let alone this city. Just as the thought popped into my head, Baltimore-based Wham City Comedy announced they would be making their way to Richmond next month for a one of a kind show. Initially created in 2004 as the Wham City Art Collective by a group of friends who met at New York’s Purchase College, the collective over time evolved into various things, including Wham City Comedy as it is now known. However, despite initially meeting in New York, it was the convenience and relative underdog status that drew all of the members, including founding member Ben O’Brien, down to Baltimore, Maryland. With such a unique and absurdist style, it is unsurprising that Wham City’s comedic inspiration runs the gamut. Between early days of performing at music shows with bands, to interacting with their audiences, to even founding member Robby Rackleff’s obsession with mundane things like Best Buy and Amtrak, it’s interesting to see how this concoction comes together to create a hot stew known as the Wham City Comedy show. At the suggestion of Adult Swim editor and ‘Off the Air’ creator, Dave Hughes, and with some mystical luck, the collective submitted a pitch to Adult Swim. Since then, Wham City has created a series of bizarre infomercials for Adult Swim such as “Unedited Footage of A Bear” and “Live Forever As You Are Now”. With so many platforms for the collective to perform on between live shows, Adult Swim, and videos, they try to keep everything as separate as possible. Although sometimes, the expected overlap works out for the best in their favor. And when it comes to their roles, the members, and crew where many different hats. O’Brien and fellow Wham City member Cricket Arrison will do a lot of the producing, fellow founding members Robby Rackleff and Alan Resnick will do a lot of the directing. The writing is mostly a collaborative effort, and depending on whose idea they are working on, they will take the lead. Originally described on the pitch document as something along the lines of a sitcom meets a Japanese horror film, but wackier, the collective took a detour from their usual brand of comedy to create “This House Has People in It”. Instead of sticking with the infomercial format they were using on Adult Swim, they decided to try expanding and see what they were capable of, and just how badly they can mess with whoever is watching at the wee hours of 4 AM. While Wham City Comedy shows are always interesting in their own way, and like a live extension of their video work from the internet and Adult Swim, if nothing else, O’Brien said their goal is for “people to have some sort of unique experience”. I’m sure that will be the case when they hit Gallery5’s stage on Sun., May 6. Tickets are on sale now, $8 in advance or at Steady Sounds, or $10 at the door. Show starts at 8 PM. With millions of views on Youtube, as well as one of the weirdest Adult Swim video’s I’ve ever seen, I’m pretty excited to see Baltimore-based collective Wham City Comedy do their thing at Black Iris Gallery this weekend. 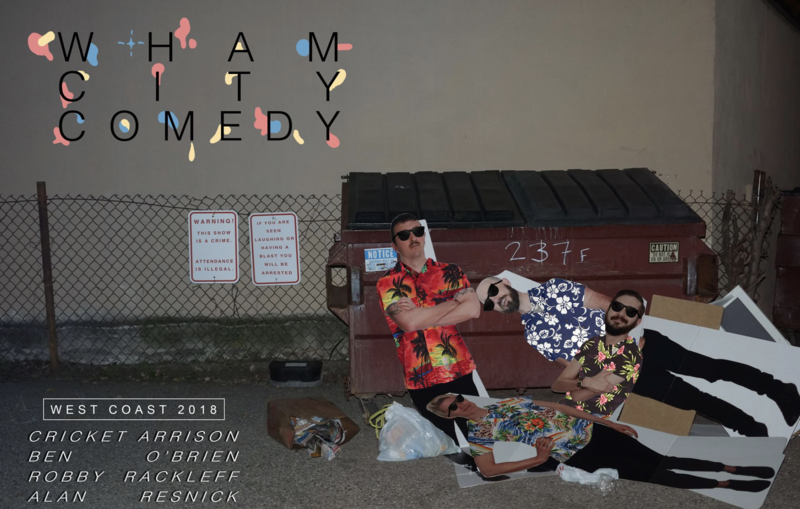 Made up of Ben O’Brien, Alan Resnick and Robby Rackleff, Wham City Comedy is a comedy & video collective based in Baltimore known for their bizarre viral videos and absurdist presentational performances. They never repeat material so they only tour once a year – don’t miss your chance! Black Iris is located at 321 W. Broad – you can snag tickets early at Steady Sounds or at the door for $10.